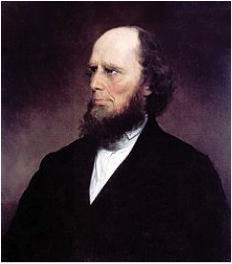 This post offers a biographical sketch of Second Great Awakening revivalist Charles Finney and summary of his most important book. Lectures on Revivals of Religion is a compilation of twenty two lectures given by Finney beginning in 1834. The excerpt below highlights two key of Finney’s key ideas, which recur throughout his Lectures. The first is that humans are responsible for and capable to respond to God. In this view he departed from the “total depravity” anthropology of Old School Presbyterianism. Thus, he blames lack of willful attention for lack of religious enthusiasm noting that “No being can look at the great truths of religion, as truths, and not feel deeply concerning them.” The second key idea in the passage below has to do with God’s way of working with humanity. Again expressing his understanding of the nature of the human, Finney believes that God “makes use of the feelings of Christians”. Religion is the work of man. It is something for man to do. It consists in obeying God with and from the heart. It is man's duty. It is true, God induces him to do it. He influences him by his Spirit, because of his great wickedness and reluctance to obey. If it were not necessary for God to influence men--if men were disposed to obey God, there would be no occasion to pray, "O Lord, revive thy work." The ground of necessity for such a prayer is, that men are wholly indisposed to obey; and unless God interpose the influence of his Spirit, not a man on earth will ever obey the commands of God. A "Revival of Religion" presupposes a declension [deterioration]. Almost all the religion in the world has been produced by revivals. God has found it necessary to take advantage of the excitability there is in mankind, to produce powerful excitements among them, before he can lead them to obey. Men are so spiritually sluggish, there are so many things to lead their minds off from religion, and to oppose the influence of the Gospel, that it is necessary to raise an excitement among them, till the tide rises so high as to sweep away the opposing obstacles. They must be so excited that they will break over these counteracting influences, before they will obey God. Not that excited feeling is religion, for it is not; but it is excited desire, appetite and feeling that prevents religion. The will is, in a sense, enslaved by the carnal and worldly desires. Hence it is necessary to awaken men to a sense of guilt and danger, and thus produce an excitement of counter feeling and desire which will break the power of carnal and worldly desire and leave the will free to obey God. In this first lecture, Finney asserts that a revival is not a miracle, but rather “result of the right use of the appropriate means” with the blessing of God. A revival is the “arousing, quickening, and reclaiming of the more or less backslidden church and the more or less general awakening of all classes” which includes conviction, repentance, and reformation. The three agents involved in conversion are God, the preacher and the sinner. 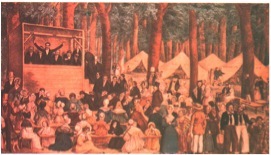 “Mistaken notions concerning the sovereignty of God have greatly hindered revivals.”. Finney closes the lecture by calling for any who learn from him regarding revivals to put in to practice what is their duty regarding them. In “How a Revival is to Be Promoted” Finney asserts that people must first prepare their hearts and minds to receive God’s word by considering their sin. Finney calls for use of “prevailing prayer” which “effectually moves God” and is characterized by strong desire, faith and perseverance. Finney also calls for prayer meetings for the purposes of strengthening Christian unity, developing compassion, moving God and causing conviction. Sinners are to be brought to conversion by individual Christians using wise strategy. This includes choosing a good time to make “a serious impression,” such as when they are free from distractions, bored, sober, in a good mood, alone, or struck by Providence, and when the evangelist is feeling love toward them. Furthermore, Finney instructs the one-on-one personal evangelist to be kind, solemn, respectful, clear, patient, self-aware and to speak to the conscience of “great and fundamental truths.” Finney warns against siding with the sinner entrenched against God or validating complaints against Christians, but instead advises calling attention to particular sins, being brief, and seeking to pray with them. Finney instructs the one-on-one personal evangelist to be kind, solemn, respectful, clear, patient, self-aware and to speak to the conscience of “great and fundamental truths.” , great article, keep the culture alive! Receiving praise from a paper-for-purchase "cheaters" service is highly disconcerting. Plagiarism trackers, look here. Having compliments at a paper-for-purchase "cheaters" assistance is trubodywellness.com actually highly disturbing. Plagiarism trackers, search here.